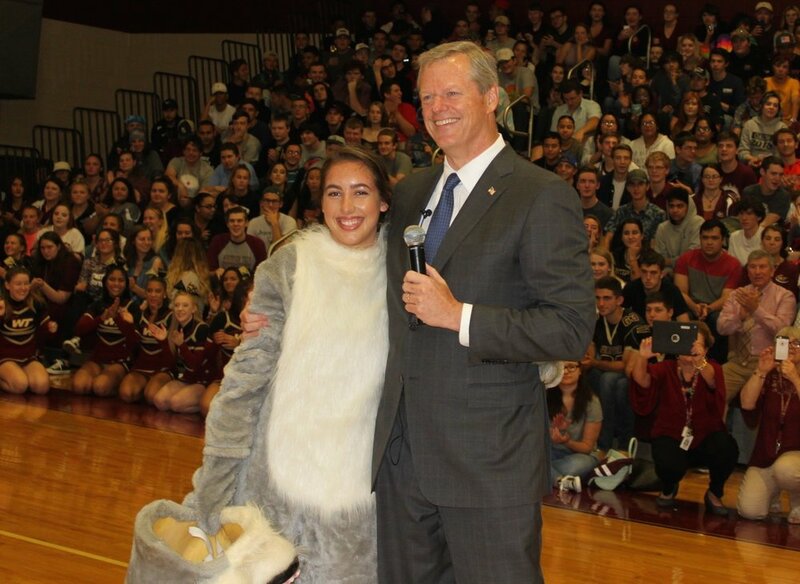 Massachusetts Governor Charlier Baker said he had never received such a welcome. As he walked into the gym and was met by 1,300 cheering students, he looked up at the stands and said, "You guys will do anything to get out of class, won't you?" He high-fived the Whittier Wildcat, played by Senior Dakota Walker, and thanked the enthusiastic crowd. "That was the most unbelievable greeting I've ever received from anywhere I've been," he said. "It's really nice of you all to come out and make some noise on behalf of the Commonwealth of Massachusetts." He was here for the ribbon cutting and opening of our newly renovated Machine Technology/Advanced Manufacturing Program. Whittier received a $495,000 state grant to purchase new machines and equipment featuring new technology to meet today's workforce standards. "Congratulations to Whittier Tech," he told a crowd of area business people and elected officials who gathered in the Machine Tech shop. "This was a competitive bid. You didn't get this unless you had an aggressive, comprehensive, strategic plan. The recommendations and commendations from local businesses were, 'if you help them, we will put their grads to work.' That's one of the big reasons why we put this together. I'm thrilled for you and your students who will now be able to play at a much higher level ... which is a wonderful statement about the faculty and kids here."